You have to feel sorry for black cats. As the Telegraph says, for centuries they have faced suspicion, hostility and even death as a result of the bad luck they are said to carry with them, but now they are having to face a new challenge, the rise of the 'selfie'. The paper reports that hundreds of black cats are being abandoned as their owners complain that they do not photograph as well as their lighter and brighter-coloured counterparts, making them less popular with those who enjoy posting self-portraits with their pets on sites such as Facebook. They add that the RSPCA estimate 70 per cent of more than 1,000 cats in its care in Britain are black or black and white. Other rescue centres said that prospective owners were asking for a cat of any other colour than black. All cats are special, it is just very sad that black cats are being rejected for purely cosmetic and shallow reasons. The record of Labour politicians and twitter is not good but at least Ed Balls has a sense of humour and the ability to laugh at himself. Nevertheless, the Independent has a bit of fun at his expense due to this self-tweeted picture of the Shadow Chancellor fondling a pigeon. 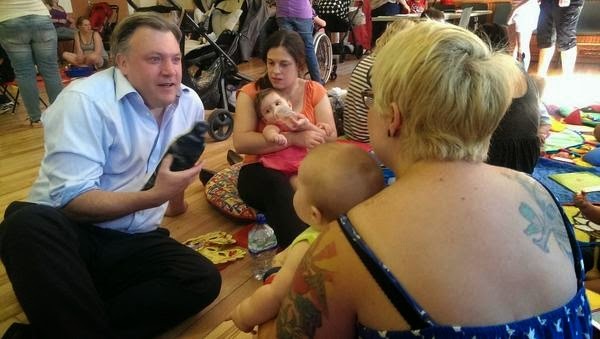 They point out that less than a week since Ed Miliband took a stand against "photo-op politics", here is Ed Balls, doing precisely that. It could be argued of course that no politician is going to abandon a decent photograph just to appease their leader's misguided sancitmony and so it proved. After all, a good picture is the best form of communication. What I cannot work out is what message this particular image is meant to convey. And what is it about Labour and birds? As the paper points out it is not so long ago that Labour had its own Twitter snafu when the party's press account accidentally promised every one an owl. It has not taken long for that promise to be downgraded to offering only a humble urban pigeon. The Telegraph reports that new planning guidance to be issued by UK Ministers will provide some protection from fracking for National parks and other areas of important countryside. Although they will stop short of a total ban short the Government's new planning guidance will make it harder to drill fracking wells in national parks and areas of outstanding natural beauty. The new rules will state that fracking should only be allowed in the most precious areas of British countryside in “exceptional circumstances”. Ministers will only approve applications if the gas and oil reserves are so large that they are deemed to be of "exceptional" national significance and any impact on the environment can be kept to a minimum. It is an effective ban. Where that leaves the rest of us is unclear.Now that the government have acknowledged that fracking does have a major environmental impact then surely it will make it harder to get planning applications through elsewhere as well. We will have to see. The Times reports that the Liberal Democrats are to shatter the coalition truce on the economy through a summer offensive to gain credit for the Lib Dems for an upturn which this week saw the economy surpass the size it was before the crash of 2008-9. More significantly, and possibly with more chance of success, the party will seek to counter the Chancellor of the Exchequer's attempts to claim credit for raising the rate at which people pay the basic rate of income tax, to £10,500, which is a flagship Lib Dem policy. Alexander and sources close to Nick Clegg say they had to “fight tooth and nail” to get their way. “We have battled hard within the coalition to make sure our priority on income tax has been delivered ahead of other things,” Alexander said. Perhaps we will also be saying what we plan to do in the next Parliament as well. The Times reports that David Cameron has added to his membership of a growing list of politicians who have commited geographically based gaffes whilst being interviewed on local radio. A flustered Mr Cameron replied: “I’m sorry, I thought I was doing…” before telling listeners that the government was pumping £90 million into the Tees Valley. Ms McCormick said that that “seems like a drop in the ocean” compared with the £470 million going into Greater Manchester and £440 million into the South East. Previously, the Prime Minister has gaffed in a BBC Essex interview in Colchester, when he apologised for appearing to suggest he was in neighbouring Chelmsford. In addition, Chuka Umunna, the shadow business secretary made a reference to Wichita, in the US state of Kansas, when he had meant to say Worcester, whilst Ed Miliband, the Labour leader, was caught out during the May election campaign when he hailed the leader of Swindon council - which is Conservative-led, but could not name the authority’s Labour leader. There but for the grace of God go us all I suppose. Despite attempts by Nigel Farage to try and change the image of UKIP there is no escaping the loose cannons in his party. The latest is a UKIP County Councillor in Cambridgeshire, who really seems to know how to win friends and influence people. “The people we describe as obese, thick, badly educated, whichever way you like to phrase it... they enjoy being 25 stone, they’re not discontent, they’re just a burden on the state,” the Cambridge News reports him saying. He then appeared to contradict himself by blaming unemployment on competition from East European migrants who were willing to live in their cars or “14 to a house”. It is almost as if they are trying to undermine poor Nigel. Given that it is Royal Welsh Show week I suppose that it is to be expected that the usual suspects would be wheeled out to support the bizarre and failed badger cull in England and to call for it to be reinstated here, in Wales. I have not been disappointed. Somehow, simplistic solutions are appealing despite the over-whelming evidence that they are entirely ineffective. So it has been with the shoot-first and ask-questions-later brigade. I was pleased therefore to see a sensible contribution to the debate in today's Western Mail from Wales’ chief vet Professor Christianne Glossop, who has managed to put her previous support for a cull of badgers behind her. Professor Glossop told an audience at the Royal Welsh Show that “finding infection, keeping out infection and stopping disease” is key to beating Bovine tuberculosis in Wales. She is now proposing testing dead badgers so as to build up an evidence base for further action. The efficacy of the vaccination and control measures introduced by the Welsh Government is apparent from the results. The Welsh Government's strategy is fairly straightforward. It is to keep infection out of farms; the rapid, early and accurate identification of infection where it does occur so that the disease can be quickly tracked; stopping disease spreading through movement restrictions; very strict measures when a breakdown is identified; and of course preventing bTB spreading in wildlife through the vaccination programme. In addition, Welsh livestock farmers have been told to insist on pre-movement TB testing of any cattle they source outside Wales. All beef and dairy cattle over six weeks old are tested when they are moved between holdings and herds are also tested annually, but this is not the case across the border in England. She concluded that the Welsh Government want to base their strategy on hard facts not opinions. It would be nice if the farmers' unions here followed suit, not to mention the UK Government. And of course if the Plaid Cymru Ministers in the last One Wales Government had taken this course of action instead of dabbling in cull-mythology we could have been even further forward in eradicating this awful disease than we are now. When I informed the Finance Committee of the National Assembly for Wales that the insourcing of the Assembly Commission's ICT service had actually saved more money that anticipated my news was met with astonishment. After all, as the chair said, it is very rare for any public sector ICT project not to overrun and cost more than planned. Alas, this is true and for good reasons. ICT projects are often not about technology at all. They are change management projects. Not only is that misunderstood but it is common for those commissioning them to overlook that essential truth because they are dazzled by ICT goodies that they only partly understand and often do not deliver on expectations. ICT projects fail or cost more than anticipated because they are not properly procured, because they are not properly project managed, because they do not secure buy-in across the organisation, because benefits are exagerated and accepted without proper scrutiny and because of an over-reliance on penalty clauses that are not worth the paper they are written on. I know as I have been involved at both ends of the spectrum, albeit on a political level rather than in managing the project. HM Revenue & Customs showed a “lack of rigour” in handling a contract for processing millions of tax returns, the spending watchdog said yesterday. The Aspire deal was costed at £4.1 billion in 2004 but it is predicted that the figure will have more than doubled to £10.4 billion by the time the contract runs out in 2017. In a highly critical report, the National Audit Office (NAO) also disclosed that Capgemini, the contractor, and Fujitsu, its subcontractor, have already reaped profits of at least £1.2 billion on the deal, or more than double the £500 million forecast. The NAO revealed that the original contract gave HMRC some of the profits from the scheme, but this right was given away when the deal was renegotiated in 2012. Profits received have only been worth £16 million instead of £71 million. The contract, which provides 650 IT systems for collecting income tax and national insurance, now costs the taxpayer about £813 million every year and no longer provides value for money, the NAO said. However, time is running out for a replacement contract, which could put tax collection “at risk”. The paper goes on to say that this is the latest in a string of troubled Whitehall IT projects. They say that the Department for Work and Pensions has written off part of its computer program for universal credit and the Home Office scrapped a £347 million immigration IT project last August. And that is just the tip of teh iceberg. What disturbs me is that nobody seems to be learning any lessons from these failures. 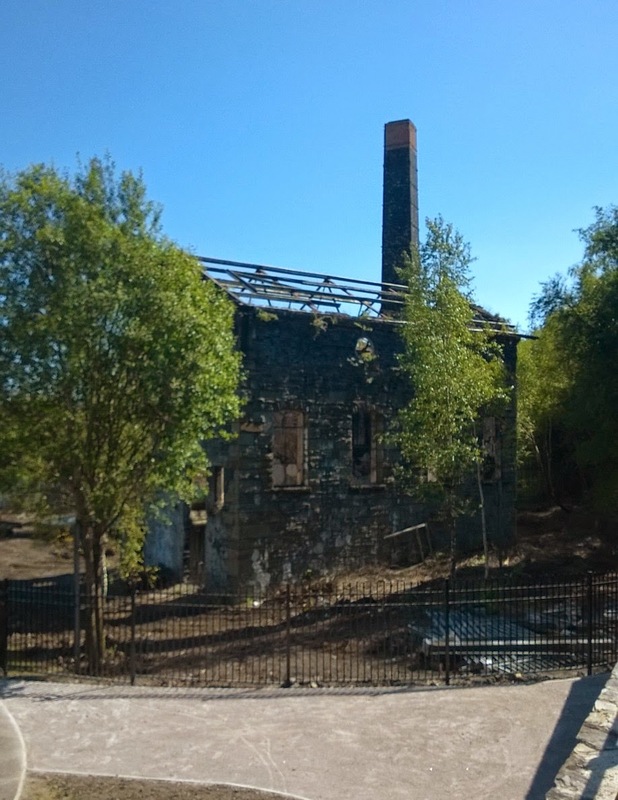 I joined the Minister for Housing and Regeneration and other Assembly Members yesterday at the Hafod Morfa Copperworks, just south of the Liberty Stadium. 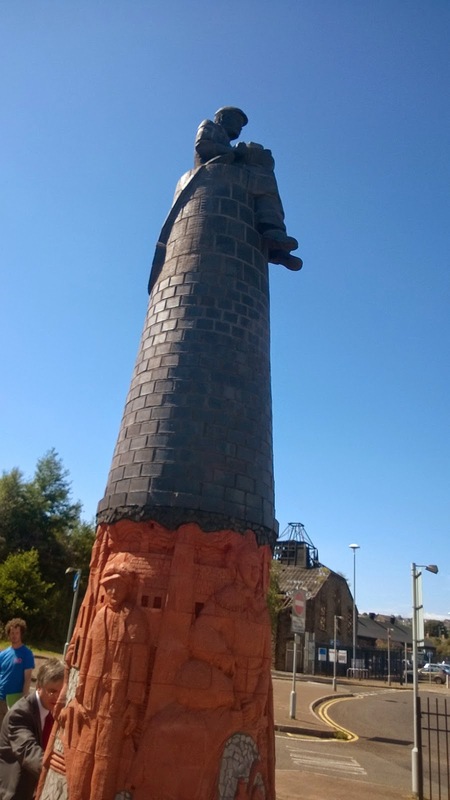 This is a Welsh Government funded regeneration scheme in partnership with the University of Swansea and Swansea Council. 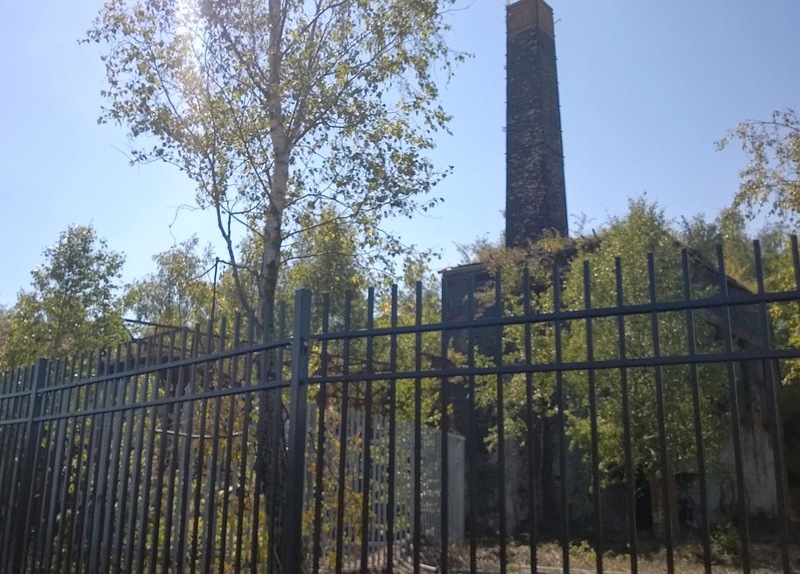 The copperworks were established from 1810 onwards and became the largest of their type in Europe by 1890. 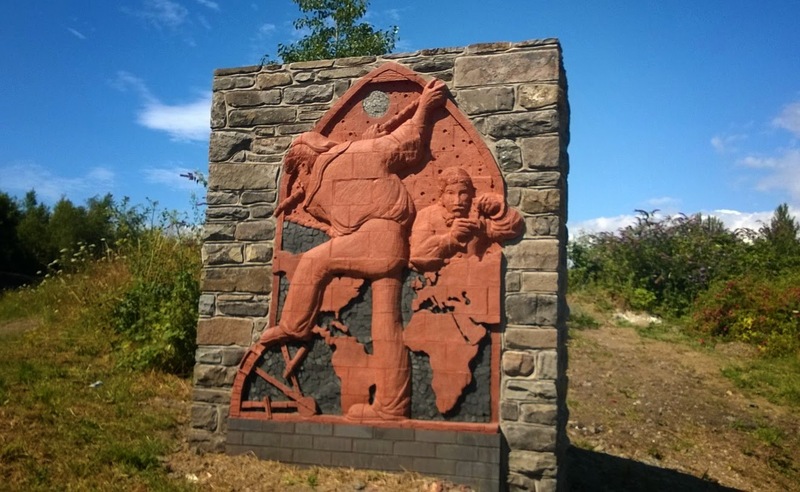 During the mid-nineteenth century, well over half of the world's copper output was smelted in the Lower Swansea Valley and Swansea became known as 'Copperopolis'. The works closed in 1980 and then were abandoned, having been partially demolished. 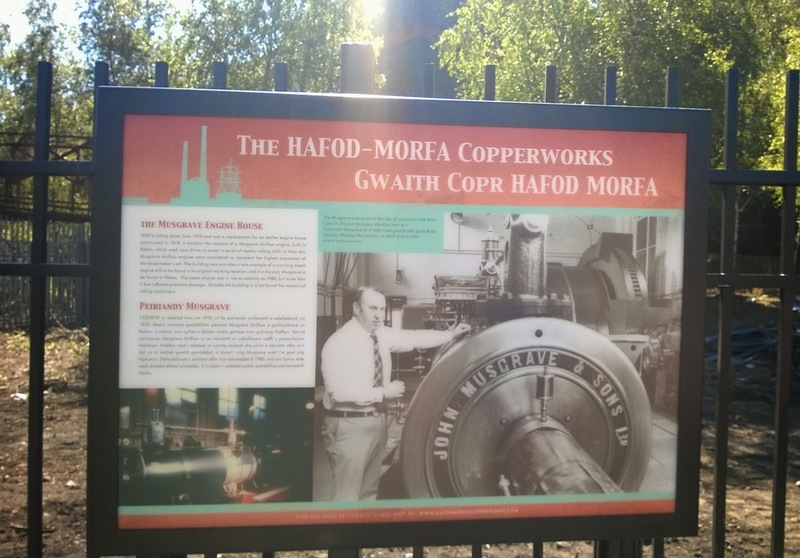 More information can be found about the copperworks and the regeneration project at the website "A world of Welsh copper' found here. In light of the news that Tony Benn's granddaughter has been selected to fight a Parliamentary seat for Labour, the Independent publishes a study of the top ten MPs who have or have had relatives in the House of Commons. Top of the pile is Nicholas Soames who is the son of Christopher Soames, the cousin of Winston Churchill, nephew of Randolph, grandson of Sir Winston, and great-grandson of Lord Randolph. Trailing iin second is Hilary Benn, who is of course the son of Tony Benn, the grandson of William Wedgwood Benn (Lib then Lab), and the great-grandson of Daniel Holmes and of Sir John Benn (both Lib). Great-nephew of Sir William Darling (Scottish Unionist, Edinburgh South 1945-1957). Husband of Virginia (Con, SW Surrey 1984-2005), uncle of Kitty Ussher (Lab, Burnley 2005-2010). Great-grandson of Sir AP Herbert (Ind, Oxford University 1935-1950). Great-niece of Emanuel Shinwell (Lab, latterly for Easington until 1970). Wife of Ed Balls, Lab, Morley. Brother of David Miliband (Lab, South Shields 2001-2013). Great-grandson of Sir William Mount (Con, Newbury 1900-1906 and 1910-1922). It is a distingusihed list and with two Benns, a Straw and a Kinnock fighting Parliamentary seats in 2015, it can only grow in size and stature. I have just had a very enjoyable Sunday lunch in the Gower Hotel, set in the picturesque Bishopston Valley next to St Teilo's Church. I would happily recommend the hotel if you wish to eat or to stay on the edge of the Gower area of outstanding natural beauty. It is located just few minutes drive from the lovely villages of Kittle and Bishopston and within striking distance of Caswell Bay, Pwll du Bay, Brandy Cove and Pennard Cliffs at Southgate. From Southgate you can explore the old haunts of Gower poet, Vernon Watkins, a friend of Dylan Thomas (and the better poet in my view). There is a memorial to him just below the cliff edge in Southgate, where you can while away the time watching seagulls circle. Equally, you can strike out in the opposite direction towards Pobbles and Three Cliffs Bay, at the bottom of a river valley dominated by the magnificent but ruined Pennard Castle. 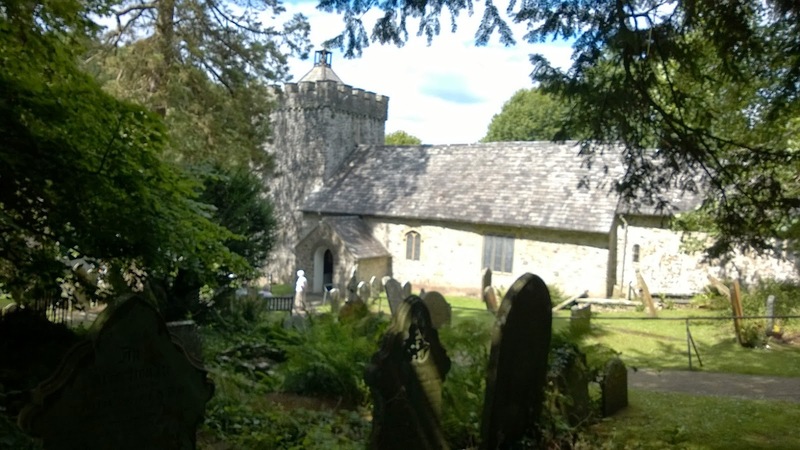 Or you could do what we did and explore the splendid St. Teilo's Church next door to the Hotel. 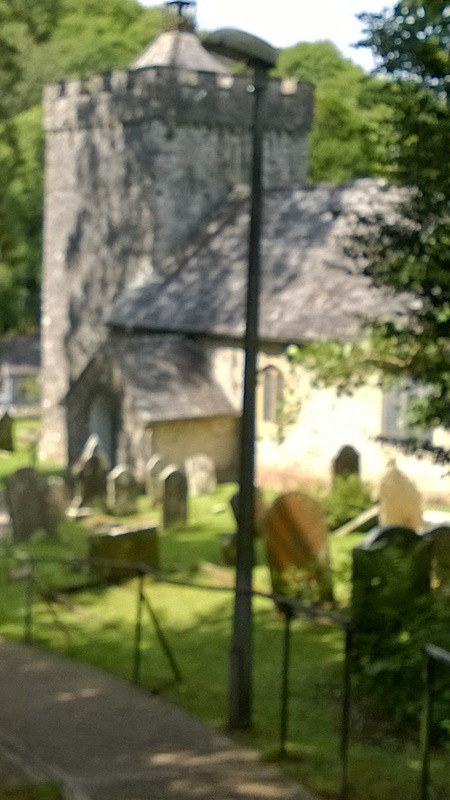 The information leaflet tells us that the parish church of St Teilo occupies the site of one of the earliest Christian settlements in Wales. The old Welsh name of the village is Llandeilo Ferwallt, which means Church of St Teilo. According to the book of Llandaff, the church dates back to 480/490 A.D. when St Teilo established a Llan (Church) hidden in a dell above the stream. This was probably a simple wooden fenced open enclosure where the faithful met for worship and to celebrate the Eucharist. Later a cell or small chapel was built on the site. The Tower is designed in the English or Norman style and is typical of Gower churches, being of simple construction, as is the main building, dating from the late 12th or early 13th century. The leaflet says that the battlements were probably restored in the 19th century but the tower was undoubtedly designed as a safe refuge for the villagers from the sudden attacks by marauders from the sea. Another notable architectural feature is the 'corbel table' of Welsh pattern which runs around the tower below the battlements. Inside the church the font is particularly worth a look. It is late Norman and is carved out of a single square block of limestone standing on a circular stem, the oak cover is modern. You can find out more about the church here whilst the Friends of St Teilo's have their own Facebook page here. Mention of Brandy Cove reminds me of a story from 1985 when a very good friend of mine captured Bishopston for the SDP on West Glamorgan County Council. At the time the new councillor was working as a customs officer. The name Brandy Cove of course refers back to the area's reputation as a centre of smuggling. The sands were used to land illicit cargo of tobacco and alcohol. There are convenient caves there and a fairly secluded footpath up to the main village. My friend's election elicited a comment about how times had changed. That day the village had elected a customs officer, a hundred years previously they would have strung him up. There are many reasons why the Welsh Government's proposed M4 relief road should not go ahead, not least the environmental impact, but also because it is based on questionable traffic projections, ties up all the borrowing provision in one corner of Wales, flies in the face of the aims of their own Future Generations bill and undermines efforts to promote and develop public transport alternatives. It is the latter reason that Gerry Holtham concentrates on in this article in the Western Mail. He asks whether the government’s plan to build a £1bn M4 relief road alongside developing a “transformative” South Wales metro concept at the same time can be achieved, suggesting that the government will have to choose one or the other, or concede that a private-public finance arrangement will be needed. The paper records that the Economy and Transport Minister's decision to go ahead with the most expensive option has provoked huge controversy among environmental groups, the small business lobby and opposition parties, who accuse her of ploughing ahead with an unnecessarily costly and environmentally-detrimental option, when an alternative £400m to upgrade a distributor road and old steelworks road was not included in the latest consultation. They add that as a result Plaid Cymru has walked out of negotiations with the Welsh Government on next year’s budget in protest at the decision. We on the other hand are staying in there for now in the hope of influencing the outcome on the M4. We will see which is the most successful strategy in due course. Did Tory Ministers have a pro-European report rewritten? Today's Times reports that Conservative ministers have been accused of manipulating an unpublished government report that they believed was too pro-European. Publication was postponed again until after the European elections in May, according to the BBC Two programme Newsnight, which obtained a leaked copy of the report. The programme said that Theresa May, the home secretary, sent it to the Home Office implementation unit, which rewrote it with more sceptical and negative comments, prompting accusations from Vince Cable, the business secretary, that it was “propagandist”. The report collected evidence on the impact of immigration from EU countries, particularly after the enlargement to cover former eastern bloc countries in 2004. It suggests that there are 2.3 million Europeans living in the UK, and 2.2 million Britons in Europe. Mr Cable told Newsnight: “We disagreed with the content and thought it was propagandist rather than objective. A study has now been produced that is balanced.” The Home Office said: “We do not comment on leaked documents. It seems that it isn't just newspaper articles that we should be sceptical of. Government reports fall into that category as well. You can tell that the Eisteddfod is near when a letter from the Welsh health minister refers to 'health bards'. Either that or the latest fad in our hospitals is for the doctors and nurses to read poetry at you until you are cured. The decoupling is in full swing this week as Nick Clegg goes on the record to point out that Cameron has capitulated to the Tory headbangers. He says that David Cameron signalled the "death knell" for moderate Tories by ending the frontbench careers of ministers such as Kenneth Clarke in the recent reshuffle. In some of his most aggressive comments about his coalition partners, the Liberal Democrat leader said the attorney general,was sacked to allow the Tories to line up with "tyrants" such as Vladimir Putin in opposing the European convention on human rights. The deputy prime minister laughed off the demotion of Michael Gove as he accused the former education secretary of creating a "destructive relationship" with teachers. Clegg was scathing about Cameron's reshuffle, which in addition to the removal of Clarke and Grieve, also resulted in the departure of the centre-ground ministers Damian Green and David Willetts. 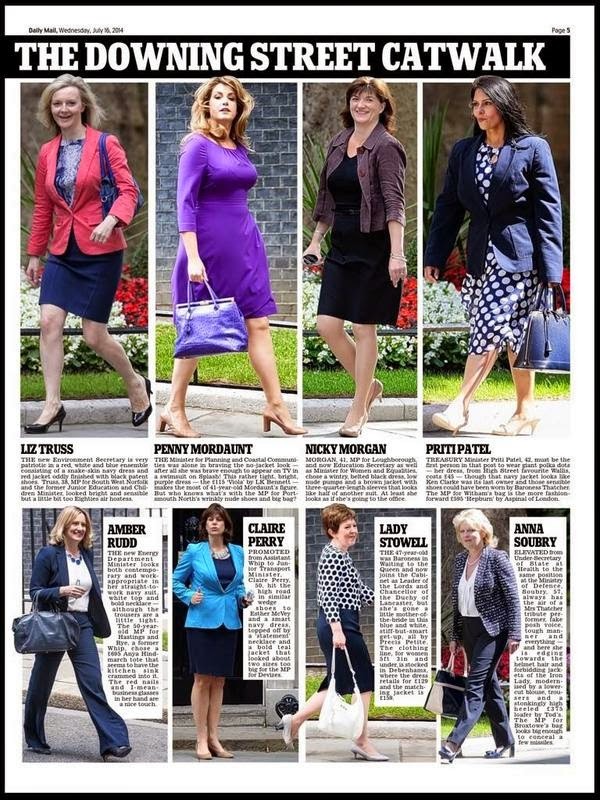 The paper says that speaking on his weekly LBC radio phone-in, the deputy prime minister said: "The real significance of this week's Conservative party reshuffle was nothing to do with gender balance. It is all to do with the death knell of the reasonable internationalism of people like Ken Clarke. The headbangers have now won. They are now, in effect, saying that the Conservative party will turn its back on a long, long British tradition of upholding human rights across the world." Clegg was highly critical of the reported Tory plan to risk Britain's expulsion from Europe's human rights watchdog the Council of Europe drawing up plans to assert the supremacy of parliament over the European court of human rights. The BBC reported that the Tories were planning to unveil a new bill of rights at their annual conference in the autumn, which would mean that the UK parliament would rule on what constitutes a breach of human rights. He told LBC: "I have been completely blindsided today by hearing that the Conservatives – extraordinarily enough – want to line up with Vladimir Putin and other tyrants around the world by tearing up our long tradition of human rights." Clegg added: "What on earth are we going to say to the dictators in Belarus, to Vladimir Putin if we do what the Conservatives now appear to recommend which is we basically say we are going to stamp our little feet and not abide by binding international human rights practices and conventions? "It is really sad to see a mainstream party like that turning its back on a great longstanding British tradition of standing up internationally for human rights. That is the most immediate knock-on effect of removing people like Dominic Grieve – you have now got a much more extreme view taking root in the heart of the Conservative party." Clegg dismissed the reported Tory plan to allow parliament to assert its supremacy over the ECHR on human rights. "The moment you say – they are going to get themselves into a terrible twist – that the government of the day, with a significant majority in parliament, can drive through parliament a rewriting of human rights disciplines you are basically accepting that human rights provisions are not universal – that they are pick and choose." Much more of this please. The decision by Nick Clegg to promote the effective axing of the bedroom tax as part of the 2015 Liberal Democrats manifesto was not a surprise. After all the party conference voted last September to do precisely that. It is nice that the leadership, after reviewing all the evidence, has caught up with the membership and the rest of the country on this issue. As an elected representative I have seen the impact of this measure at first hand. It is not of course a tax, but it has led to many tenants getting into arrears because the was no alternative accomodation for them to move to. It also had an impact on people with disabilities, especially those living in adapted homes and those who need space for overnight carers. I held a debate on the issue in February of this year, highlighting in particular the difficulties of depending on discretionary housing payments to mitigate the impacts of withdrawing the spare room subsidy. In that debate I set out my position that disabled adults should be exempt and that the bedroom tax should apply only as and when people take up new tenancies. The changes announced by Nick Clegg, which we will be pushing for from now on very much mirror my views. Although it is a reversal of his position, it is based on a close analysis of what is happening on the ground. The review concluded that the evidence from the interim evaluation of the policy shows that the bedroom tax has not been working in the way in which it was intended. As a result we want to change the rules so that existing tenants aren’t penalised when they cannot move into smaller accommodation because this is not available or where there is a serious medical reason for an additional room. We will therefore go on applying the existing rules to new tenants but existing tenants who are ‘under occupying’ will not have their housing benefit cut unless they have been made at least one reasonable offer of alternative social rented accommodation with the correct number of bedrooms. We will also ensure that when tenants have a significantly adapted property or genuinely need a second bedroom for medical reasons, they do not face a housing benefit penalty. More significantly the party has at last recognised that the real problem is a shortage of suitably sized housing. We need to address that urgently. Commonsense has prevailed at last. It is as if we were still in the nineteenth century. The latest in a long line of senior Labour figures to question Ed Miliband's leadership is the heavyweight former Home Secretary, Charles Clarke. Charles Clarke said that Labour has "no narrative" and Ed Miliband is failing to appeal to voters because he has an "assembly of odd policies". Mr Clarke also criticised Mr Miliband for failing to "set out clearly" how he would control the deficit and said Labour is unlikely to regain public trust in its ability to handle the economy. They go on to report that Mr. Clarke's interview with the Huffington Post: "I think the most likely outcome is a Tory overall majority. You've got to set out an overall account of what it is. And I don't think we have an account and I think that's Ed's biggest challenge. "[He has got to] Set out a clear statement of what Labour would actually do. Give people a reason to vote Labour. not an assembly of odd policies like the electricity freeze or whatever. [He] lacks an overall story." Mr Clarke, who served as Neil Kinnock's chief of staff in the 1987 and 1992 General Elections, said the former Labour leader has "far more qualities" than Mr Miliband. He said: "Neil has far, far more qualities than Ed Miliband as a leader. Neil was a fantastic leader and brought Labour back towards victory." It is clear from these statements that even if Mr. Miliband followed the Prime Minister's example of carrying out a major reshuffle, he would still not satisfy the big beasts in terms of his narrative and direction of travel. It is fair to say that neither of the two UK coalition parties have a particularly good record in promoting woment to senior positions. In the case of the Liberal Democrats the main problem has been getting women elected. We will make a huge effort to put that right in 2015. For David Cameron, the reshuffle promised for this week could be a major step forward. Political pundits predict that he is poised to promote a number of women into the cabinet and other ministerial positions. For some however, that is not enough. Sometimes you cannot do right for doing right. Brazil tell me how it feels! As football chants go this is actually rather classy in a needling-the-opposition-sort-of-way. Not sure about the claim that Maradona is greater then Pele but I suppose that depends on your perspective. English sub-titles at one minute ten seconds in. As rumours grow of a major government reshuffle next week, the Independent reports that Nick Clegg is opting out and will be deferring any changes he wants to make until just before the Liberal Democrats Conference in October. Speculation had been that Mr Carmichael, who was brought in as a more combative figure for the Better Together campaign, would be axed this week in favour of Jo Swinson. Yet this would have been seized on by Alex Salmond and his supporters as an admission of failure. Other possible ministers who could be moved in the autumn are Ed Davey, the Climate Change Secretary. Mr Clegg is being urged by some allies to sack Business Secretary Vince Cable, who was weakened by the botched coup in May, and Mr Davey could be lined up to replace him. Mr Clegg is under pressure to leave Mr Cameron's side during Prime Minister's Questions and get out campaigning instead. The Lib Dem blogger Stephen Tall said: "Focus groups show the public is baffled why Nick Clegg simply sits next to David Cameron without ever speaking at Prime Minister's Questions. To them, he appears mute, powerless, sidelined. The time could be much better used." Today's Western Mail reports on a poll that identifies health as the single most important issue for people in Wales at next year’s General Election. The poll, which was undertaken on the paper's behalf by Cardiff-based Beaufort Research, shows that 32% of voters say health will be the key determining factor for them next May. Health was mentioned by a significantly higher proportion than the economy. The next most significant issue for voters is the economy (selected by nearly one in five – 19%), followed by immigration (15%) and education (11%).This is despite the fact that the UK Government is not responsible for health or education in Wales. Clearly there is quite considerable dissatisfaction with the health service in Wales. Reorganisation, poorer outcomes, the closure of services, scandals about the treatment of patients in some hospitals and general discontent with some services have taken their toll. The big question though is how this will be reflected in the polls in a significantly Labour-facing country? Do people think that the UK Government is responsible for health services in Wales, in which case this poll reflects general dissatisatisfaction with the ruling UK parties? Or will we see a backlash against Labour for their poor handling of health in Wales? This is the ultimate test of how far-reaching devolution has been and how widely understood it is. Contrary to my little conspiracy theory on Wednesday, the First Minister has now stated that he is satisfied that no employees of Welsh Labour colluded with sacked Cabinet Minister Alun Davies when he sought information about farming subsidies paid to five opposition AMs. So really, he does not actually know whether there was a conspiracy or not. Furthermore he admits that the natural conclusion any reasonable person would draw is that there was a conspiracy. Very convincing! Yesterday saw a series of strikes by public servants that caused disruptions across the country. Schools were closed, parks were locked, Cardiff experienced gridlock as the Bute Tunnels were closed and access to services were severely restricted. So far, so good. The unions have made an impact and got our attention. What got my attention was Neath Port Talbot's failure to consider how it was going to work around the strike so as to provide the service that its council taxpayers fund. They have the second highest council tax in Wales and yet Neath Port Talbot are the only council in the country not to make alternative arrangements for rubbish collection. 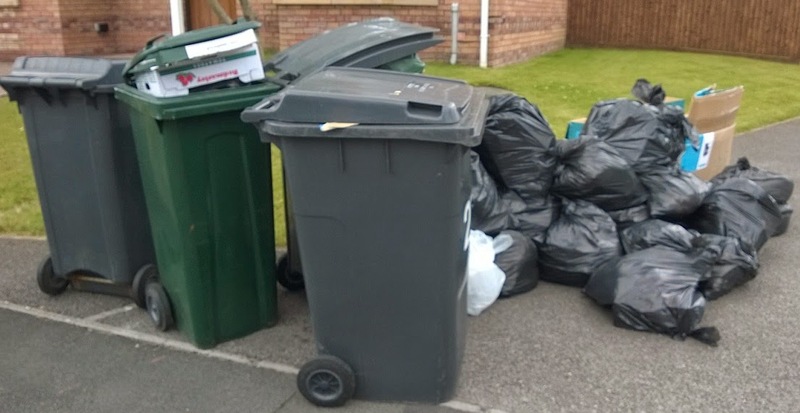 In Swansea we have catch-up collections on Friday and Saturday so that people are not in the position of having rubbish, including kitchen and garden waste, hanging about for an extra week before being picked up. In Neath Port Talbot residents will have to wait an extra two weeks before their rubbish will be collected on the next normal day in the cycle. I was out and about in the area yesterday and saw lots of bins and black bags on the pavements awaiting collection. How many of these will be taken back in? And where will residents store them, and the additional two weeks of material that will be accumulated before eventual collection? Neath Port Talbot Council need to remember that not everybody lives in a big house with a large garden where they can store rubbish at the council’s convenience. Not everybody in Neath Port Talbot has their own car so that they can take their rubbish to a civic amenity site as the council unhelpfully suggest that they do. On top of that, Neath Port Talbot has recently spent £733,000 of taxpayers’ money on replacing people’s wheelie-bins with ones that hold less, so those householders will be doubly disadvantaged. I am astonished that this Council is reinforcing their growing reputation for treating their voters and council tax payers with contempt by failing to adopt more sensible and customer-focussed refuse collection arrangements. Whilst Assembly Members and the Cardiff-based media have been obsessing about Alun Davies, some more serious problems have been slipping under the radar. The Western Mail reports that fourteen years after the landmark Waterhouse inquiry into child abuse in care homes called for young people to have the help of an independent advocate, too many do not have this important service. The Children's Commissioner has produced a a major report, Missing Voices: Right to be Heard. He said: “I can’t deny that there has been some progress but it has been patchy and it has been slow. There have been too many excuses for why change has not happened more quickly and in the meantime the situation for children and young people remains much the same. “Advocacy is a primary safeguarding service and we cannot accept the current situation where access to, and quality of advocacy is a postcode lottery for our most vulnerable children and young people. The current prominence of historic child abuse scandals demonstrates the immediate need to get advocacy right for children and young people today. According to his latest report, 63% of 384 children in care questioned did not know who their advocacy provider was. These advocates should also be provided if the child or young person wants to make a complaint. Perhaps the Welsh Government should turn its attention to this issue now. In retrospect the sacking of Alun Davies as Minister for Natural Resources and Food was inevitable even if the Western Mail took a week to wake up to the fact that he was not a future First Minister. The attempt to abuse his ministerial office so as to obtain personal information on his opponents was the last in a long string of offences. However, the chain of events do raise some disturbing questions. 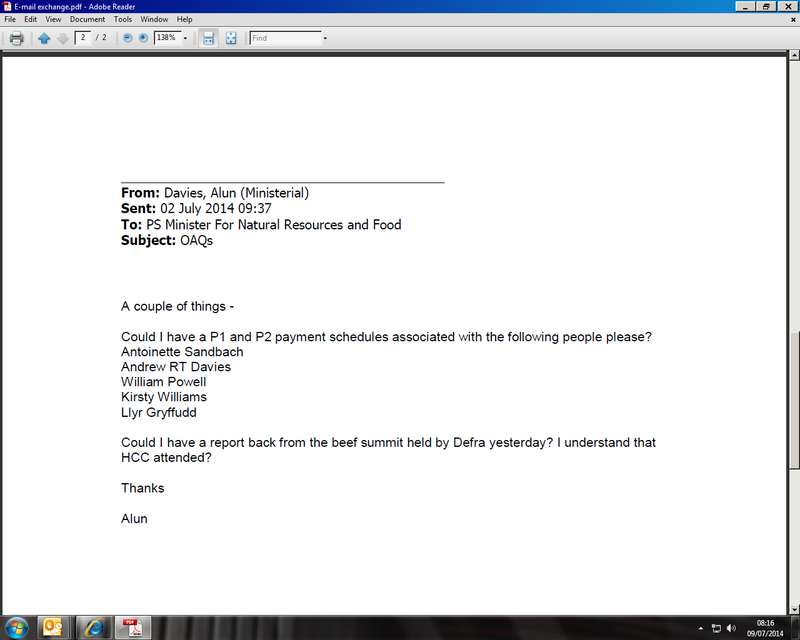 At At 9.37am on 2 July, the day after the First Minister decided not to sack him for breaching the Ministerial code, the day after he had apologised to the Senedd and the day after he had come under sustained personal attack from opposition Assembly Members, Alun Davies emailed his private secretary to ask for information on farm payments paid to five AMs and their fanilies. The e-mail is below. Kirsty Williams, in the same way as the other four AMs has always properly declared her interest and there has never been any suggestion of her or the others doing anything wrong. The tweets are below. Was the information sought by Alun Davies needed for a planned smear campaign on the five Assembly Members by unnamed Labour campaigners? Was he acting alone or were his actions part of a wider Labour strategy to throw dirt at the opposition by implying that there was something untoward about perfectly legitimate payments? When the First Minister makes his statement on Tuesday, he will do so knowing that these and many more questions will remain unanswered for some time to come. If we are to resolve them however, then he needs to adopt a far more consensual approach and work more closely with others. There is political agreement that there are too many councils and that something needs to be done about it. It is at that point that consensus breaks down. Compromise is possible but only if the Welsh Government is prepared to make concessions and to listen to others. This week will be the first test as to how far they are willing to go in bringing others with them on this agenda. Today's Western Mail reports on the latest episode in the so-called 'war on Wales'. They say that the Shadow Welsh Secretary has written to David Cameron to express his concerns about the impact of high-profile criticism of Welsh infrastructure and health services. Owen Smith argues that a “wellspring of negativity” is damaging business confidence when the country should be preparing to make the most of September’s Nato summit at the Celtic Manor resort and that UK cabinet ministers are taking “every available opportunity to undermine Wales’ reputation”which is damaging Wales’ “brand”. Business people seem to take a different view. They want to see standards in education improve so that they have a skilled workforce to draw on. Like many other people they are concerned at the failngs of the Welsh education system and the poor outcomes for those using the Welsh health service. And he is absolutely right. The arrogance of Welsh Labour in seeking to turn criticism of their poor performance in government into an 'attack on Wales' is breathtaking. They need to step up and take responsibility for their failings. Despite some of the over-the-top rhetoric, it is absolutely right and defensible for UK Ministers to compare and contrast their record with that of their counterparts in Wales. That is especially so when Ed Miliband is seeking to use Wales as his benchmark for a future Labour UK Government. Carwyn Jones et al criticise the UK Government in the siambr week-in, week-out. Are they really arguing that the David Cameron and his ministers cannot reciprocate? The Independent reports on a useful initiative from the UK Government that will enable credit unions to take on pay day lenders directly. Excluding Northern Ireland, the UK has 400 credit unions with about a million members in total. By March last year, members had saved £843m with the credit unions, around £620m of which was on loan. The Government is keen to raise these numbers. Credit unions tend to be more lenient than high street banks towards people with bad credit histories. Their highest APR is still around 40 per cent, though some charge as little as 7 per cent, making them a good alternative to payday lenders. The Government has put £38m into the Credit Union Expansion Project, which launches next April. Under the scheme dozens of credit unions will pool their resources to cut down on administration costs. The project is run by the Association of British Credit Unions Ltd (Abcul) and will vastly improve the industry's use of IT, enabling instant credit scoring. More than 80 credit unions, representing around 400,000 members, are interested in signing up, and another 20 are considering it. A shared system will let credit unions approve loans online. It is thought that many people go to payday lenders not just because of poor credit histories, but because they need the money quickly and have nowhere else to turn. However, they must repay the money after just a few days or weeks. Credit unions let borrowers pay back their loans over a longer period. The more that can be done to provide alternatives to pay day lenders the better, and the use of new technology is one way forward. Perhaps the Welsh Government should learn from this initiative and instead of spending over £600,000 on a pointless advertising campaign, use its limited resources to expand the capacity of Welsh credit unions in much the same way. What better way to attract my attention than by combining my two favourite things, cats and the welsh coast. Cat walk is given a whole new meaning in Jackie Morris' latest book which follows felines as they explore the Pembrokeshire coast. Indeed, forget fashion, it's all about purry, furry friends as the best-selling author, illustrator and photographer captures the curiosity and charm of her cuddly companions. The tail (sorry, couldn't resist) follows Morris' eight cats, whose names are just brilliant. Meet Pixie, Maurice, Elmo, Martha, Max, Lady Spittifer, Little Bear and Little Leopard as they uncover the St David's Peninsula and the surrounding area. It is worth clicking on the link just to look at the photos. They are stunning. Those who advocate that the culling of badgers is the only way to stop the spreading of bovine TB will hopefully have been disabused of that simplistic notion by the results of a new study which shows that such activity has 'relatively little impact' as the animals are not to blame for most cases of tuberculosis in cattle. They said that 10 per cent of farms were acting as “super-spreaders” because they moved animals around frequently. Academics from the universities concluded that the only way to halt the disease was through culls of entire herds of diseased animals, on the scale of those seen in the foot and mouth outbreak. But that would mean 20 times more animals being killed than are slaughtered each year at present. They said that the best way to halt the disease is through widespread testing and vaccination programmes or culling infected herds. What is staggering is that 84 per cent of outbreaks are caused by the movement of infected cattle, by infected fields or wildlife and by the failure of tests to detect diseased cattle. I do not advocate the mass culling of cattle anymore than I support culling badgers. But if this research is not enough evidence to support better controls on cattle movement and the vaccination of cattle (and badgers) then I do not know what is. Labour, in the hands of the unions? In a move designed to cauise major problems for Ed Miliband, a senior Unite official has claimed that trade unions are demanding a dedicated seat at the Cabinet table under a Labour government. Unite has donated £12 million to Labour since Ed Miliband became leader, making it the biggest single donor. The Tories claim the funding gives trade unions undue sway of policy and candidates. Mr Turner, a close ally of Mr McCluskey, told a meeting at Unite’s policy conference in Liverpool that the union is seeking a change in the law to make it easier to call strikes. It also demands for greater powers for unions inside companies, he claimed. If any of this is true the Tories will have a field day at the next General Election. |It is one thing having the party funded by the trade unions, quite another to have them effectively running any Labour Government that may be elected. 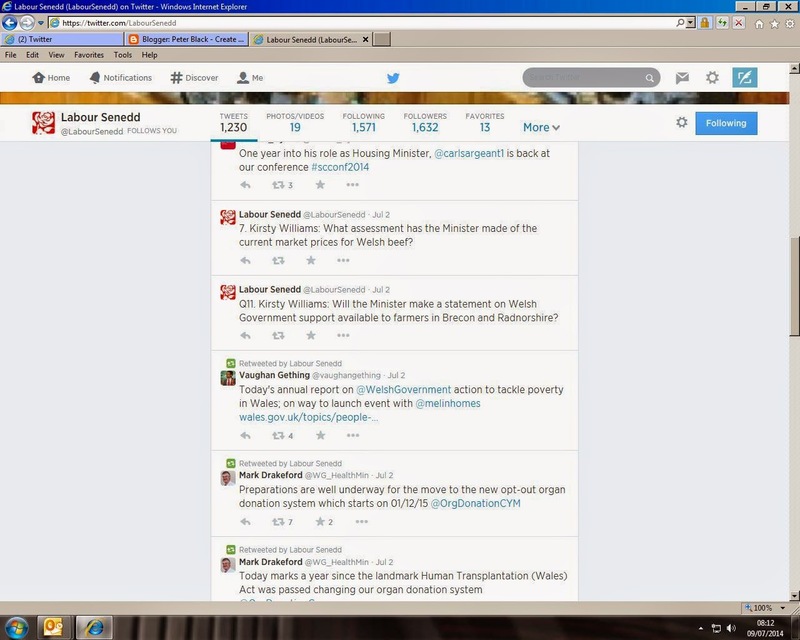 I have commented before on Prince Charles habit of seeking to use his privileged position to influence public policy. Back in November 2008 I said that Charles may be in line to succeed to the position of Head of State by an accident of his birth but that does not give him the authority to contradict those who have been voted into office by the people. Nor does it give him any legitimacy to 'speak for the nation'. So this story in The Times, who report that the Prince of Wales tried to persuade Tony Blair’s government to expand grammar schools and limit the use of genetically modified crops is no surprise. What does surprise me is that Peter Hain indulged him on trialling alternative medicine, something that has little or no evidence base to recommend it. If only everybody had his level of access and influence.